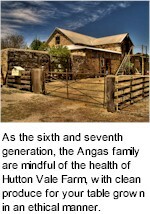 A block or two of tough, inhospitable soils on the Hutton Vale property were planted to Grenache in the 1960s. Growing conditions were so disfavourable that many of the vines failed and had to be replaced, a highly opportune setback which turned out to be a windfall, as the recalcitrant parcels were mistakenly planted with Mataro, the stylistic soulmate of Grenache. Fermented on skins for a week, followed by two years in seasoned and new French oak puncheons, loaded with red and black fruits, savouryness and licorice, a fine tannin line, supple and soft.